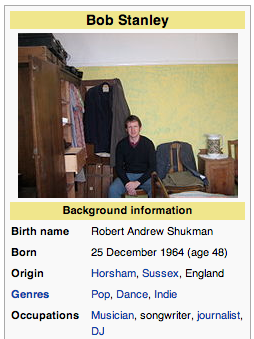 Placing emphasis on celebrities having a good visual presence on Wikipedia may seem a little trivial. But Wikipedia is now the most common database for celebrities, so their images should reflect their legacies. But with Wiki’s copyright restrictions, actors normally default to amateur shots from the red carpet. Footballers favour fan’s photos from pre-season friendlies. MPs regularly hire interns to manage their Wiki pages – so why do the below icons have such poor visual representation? Who’s managing theirs? Let’s sort it out. Being both a national hero and the spearhead of English footballs transformation from the soggy 80s to sunny afternoons of Euro ’96, epic shots of Gazza are in no short supply; tears at Italia ’90, the dentist chair, the death-threat-warranting sectarian flute miming. Strange then, that the profile picture accompanying his Wiki entry is one from a webcam of him in a second rate hotel room, no doubt skyping Raoul Moat in prison, naked from the waist down. It’s not impossible that Jimmy Five Bellies now serves as his social media manager, but given his recent leap onto Twitter, you’d think his team would have all bases covered. 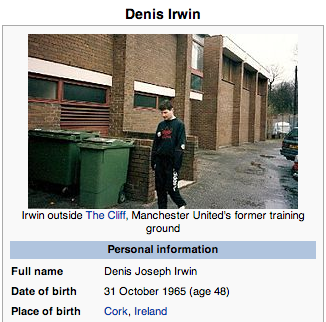 You wouldn’t expect there to be a plethora of Denis Irwin portraits to choose from. No shots of him as a panelist at Comic-Con (Nick Frost) or the World Economic Forum (Robert Mugabe). But in a career spanning several Premier League, FA Cup and European Cup titles you’d think there’d be a better one then by the bins at Utd’s old training ground. 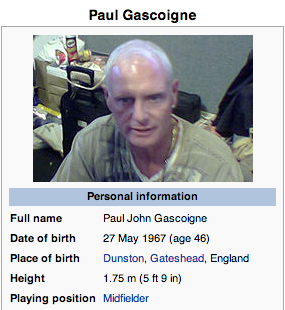 Okay, the fact I included his occupation in brackets perhaps suggests I’m pushing it with iconic status. But he was part of a Mercury prize winning band, that are actually pretty decent beyond their Neil Young cover. So arguably deserves a better photo than one of him in his parent’s bedroom. It’s a photo you’d find between the pages of a second hand book; a photo that people say tells a thousands stories but sadly on its own merit actually does anything but.